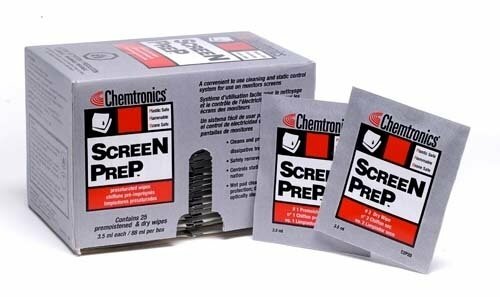 Screen Prep™ Presaturated Wipes are a convenient cleaning and static control system for use on monitor screens. This two part system is excellent for use on computer display screens, scope and dial faces, and glass and plastic surfaces of instruments. These highly effective cleaning wipes are safe on plastics and are ideal for cleaning sensitive surfaces. Screen Prep™ provides a static–dissipative treatment to the surface to control static–generated contamination. Screen Prep™ removes dust, fingerprint oils and other vision-inhibiting contaminants, and leaves no residue. Screen Prep™ Presaturated Wipes contain isopropyl alcohol and an anti-static agent.